What happens if you put together three crazy pianists on a quiet evening on the day after a demanding concert with all the equipment ready to record? They just sit down and play until they close down the Church! So that’s what we did, three friends just sitting down at the beautiful Fazioli Grand Pianos and starting to play without any words. A Canadian pianist -composer with a great affinity to Jazz, a Dutch piano Improviser with his main roots to the Blues and another Dutch pianist-composer with a more minimalist approach. The result is a recording including a journey though several musical areas; from classical, to blues, free jazz, avant garde with influences of George Crumb, Simeon ten Holt, Olivier Messiaen, Steve Reich, Arvo Pärt and many others. 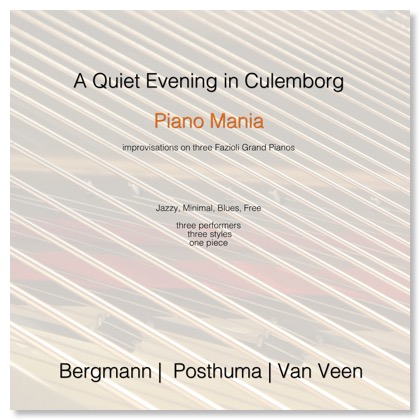 There was no time for words, and that was the start of this special album Piano Mania I: ‘A quiet evening in Culemborg’. There were two basic connections established before we played together: first, we like the sound of the piano very much and second, we like the Keith Jarrett improvisations. The music brought us together and bound us as one unity, as if we had played together for many years. 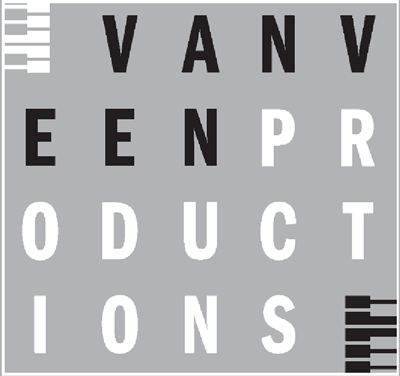 Fred Oldenburg and Jeroen van Veen founded the Piano Ensemble in 2000, in order to present the piano music they play (perform) in various international ensembles. Multiple piano playing is one of their missions - from one up to 6 pianos. Premieres were given in Canada, the United States, Russia and the Netherlands, of works by Dutch composers like Simeon ten Holt and Chiel Meijering and of British composers like Gabriel Jackson and Tim Seddon. Current members of the Piano Ensemble are: Elizabeth & Marcel Bergmann (Canada), Irene Russo, (Italy) Fred Oldenburg (The Netherlands) and Sandra & Jeroen van Veen (The Netherlands). Most of the premieres took place in Culemborg, where the Lek Art Foundation organizes a concert and an Art Festival every year. The line up of performers on this CD are Marcel Bergmann, Jeroen van Veen, and guest artist Rinse Posthuma.